Fully immerse yourself in the traditions of Japanese performance art during a 1-hour Noh experience in Osaka. In a rehearsal area usually restricted to the public, you’ll watch actors perform theatrical art wearing elaborate costumes and masks. Listen to traditional Noh songs, delve into the history of the cultural tradition, and capture photographs with the beautiful dressed performers. This small-group tour is limited to 10 people in order to maintain an intimate atmosphere. Your experience begins at the entrance to Yotsubashi Station, approximately 10 minutes by train from Osaka station. 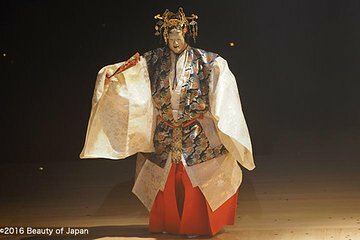 Here, you’ll greet your guide and discover the ancient history of Noh, a theatrical performance art declared a UNESCO Intangible Cultural Heritage. On arrival at the theater, you’ll enjoy exclusive access to a rehearsal area usually restricted to the public to get acquainted with the characteristics of Noh. Learn about stage design and the tools used for the performance, and watch actors sing and perform wearing silk kimonos and elaborate masks. After capturing photographs with the performers, your tour concludes back at Yotsubashi station.